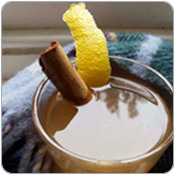 The holidays are a time for tradition, and what says traditional like a good old fashioned Hot Toddy? Stay warm and cozy throughout the Fall and Winter with a belly full of spiced Johnnie Walker! Wonder how much whisky you would need to mix these up in a tote tank…. Put the water in a small pan along with the spices and lemon peel over a low heat. Bring to a gentle simmer. Meanwhile rinse a heatproof glass with hot water and dry. Pour the whisky into your warmed glass, then add hot water and spices. Stir in the honey and lemon juice and taste for sweetness. Top with a little nutmeg, and breathe in deeply.